Get down and dirty with the AfterShock Bass Distortion. Out of the box, this stereo pedal delivers three bass overdrive engines that span the gamut of low-end crunch, from smooth and natural overdrive to full-on fuzz attack. The Tube engine belts out a subtle, but powerful vintage tube overdrive with a smooth breakup and plenty of punch. Heavy creates an aggressive scooped sound with ample highs and thundering lows. The Fuzz engine offers intense germanium fuzz tones with loads of bottom and mucho grit. The Aftershock’s simple, yet powerful control panel provides the tools to finely sculpt the perfect bass tone. The Clean knob lets you to mix in just enough clean signal to maintain a rock-solid low-end without compromising the pedal’s SONIC GROWL. Adjust the onboard Tone control and find that thunderous sweet spot for any bass/amp combination. By itself the AfterShock offers tremendous tonal range, but dig a little deeper and discover its hidden power and flexibility. Every pedal in the One Series line is compatible with the Neuro Desktop Editor and Mobile App (free downloads iOS, Android, Mac and Windows). Connect the AfterShock to the Neuro Editor and access its extended equalization capabilities, stereo routing options, as well as Source Audio’s free library of over 40 overdrive, fuzz, and distortion algorithms for bass AND guitar — each algorithm can be downloaded directly to the pedal. The Aftershock is also built on dual drive platforms providing the opportunity to simultaneously run two fuzz tones in parallel, stacked, or split in stereo. Plus, every One Series pedal is fully MIDI compatible when coupled with the Neuro Hub (formerly Soundblox Hub), providing the power to save up to 128 different presets. The only bass distortion pedal you'll ever need. Our friend Adam Aarts pulled some amazing tones from our monster bass drive - dig. Truly Divine! Jase of the band Divine Ascension journeys through a fantastic collection of classic bass riffs and does it with style and stellar tone. The ultimate bass effects video! Our own Nathan Navarro rocked the house with this amazing demo. Lots and lots of great Aftershock Bass Distortion moments in this one!! Bassic Gear Reveiw found some amazing bass tones in this fully comprehensive Aftershock demo. Let's get low-down and dirty. Job one in the development of the Source Audio One Series overdrive pedals - The L.A. Lady Overdrive, Kingmaker Fuzz, and Aftershock Bass Distortion – was to create three great sounding, flexible, and easy-to-use pedals. Out of the box, that’s exactly what they are – plug ‘em in, select from the three onboard overdrive engines and make beautiful music… simple. But there is much more here than meets the eye (and ear) - the truly “Big Idea” behind our One Series overdrive pedals was to give musicians a second, far deeper, set of options and editing tools with which to craft the perfect tone. The Neuro Desktop Editor and Mobile App are free downloads for iOS, Android, Mac and Windows machines. The Neuro Editors vastly expand the tonal possibilities of the pedals, offering a huge collection of additional drive, fuzz, and distortion engines as well as an expanded set of editing parameters. 3 Distinct Fuzz Engines - Flip the center toggle switch and select between three different bass distortions. 3 Presets — Use Preset Mode to save a different preset to each of the three toggle switch positions. When the pedal is engaged, all of the parameters instantly jump to their saved value, regardless of the knob positions. Stereo Input and Output Jacks — Distort upstream stereo signals, split a mono signal to dual outputs, or use the additional in and out as an external effects loop. Stackable Drive Engines — Dual drive engines and stereo inputs and outputs make it possible (via the Neuro App) to stack any combination of drive engines in either series or parallel as well as split the signal and send a separate drive engine to each of the pedal’s outputs. Universal Bypass — Select either analog buffered or relay based True Bypass. External Control — Compatible with Source Audio expression pedals, the Source Audio Tap Tempo switch (which also acts as an external switching mechanism), and the Hot Hand 3. 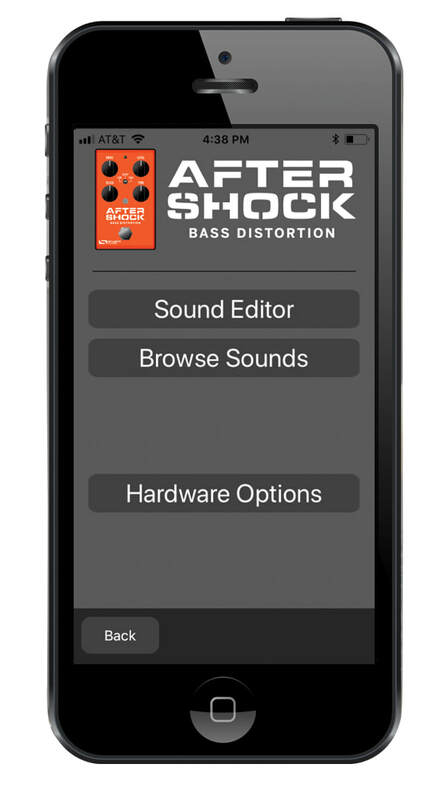 Connect the Aftershock Bass Distortion to the Neuro Mobile App (a free download for iOS or Android) and explore the power of effect downloading, customization, and sharing that comes with every Ones Series pedal. Free Effects Downloads — — Every Source Audio overdrive, fuzz, and distortion algorithm is available as a free download directly to your L.A. Lady Overdrive. Customize Effects — Access Neuro’s extensive equalization capabilities or experiment with multiple drive circuit blends and stereo splits. Advanced Signal Routing — Choose from a range of signal routing possibilities like effects send, multi signal mixing, or mono signal splitting. Save and Share Customized Presets – Once you’ve fine-tuned an effect, save it to your personal effects collection and share it with the growing community of Neuro users. Download Presets — Explore Source Audio’s ever-expanding library of effect presets. Simple Connection — The Neuro App. connects with the L.A. Lady via the mobile device’s headphone jack and Stereo Input 2 on the pedal. A Neuro App connector cable (1/8” to 1/4”) is included with the pedal. The Aftershock also features full MIDI capability and simplicity when coupled with the Neuro Hub (formerly Soundblox Hub). Preset Saving — Save up to 128 effect presets. Multi Pedal Scene Saving — Connect up to five One Series and Soundblox 2 pedals to the Neuro Hub and create 128 multi pedal scenes, recallable via MIDI program change (PC) messages. External Expression Control — Connect the Neuro Hub to any Source Audio expression pedal, Hot Hand 3 Wireless Effects Controller or third party TRS (Tip Hot) expression pedal for on-the-fly control of any adjustable parameter. Includes 1/8” to 1/4” cable for Neuro Mobile App connection. USB port — Connects to Mac or Windows PC for firmware updates and the forthcoming in-depth effects editing software.